If cute little animal clipart is your thing then you're going to love the collections I've scoped out for you here today. First, however, please allow me a little self-indulgent chatter as I offer a background story on why this choice was made. A repugnant fellow has decided to move into our neighbourhood and having made his presence known in his typical style he's become not just an unpopular addition but most definitely an unwelcome one. You too have met his kind before, I'm sure — brazenly roaming where he pleases as if he has every right to be there. 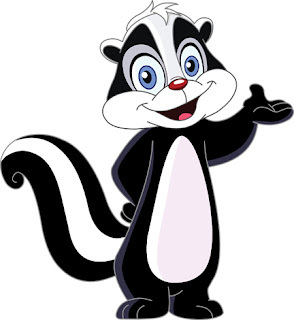 He's short on personality, a black-and-white sort of critter. And if all of that isn't bad enough, he stinks to high heaven. It was a bitterly cold dusk a few days ago when we first became aware there was a skunk in our midst. Standing at the back door, my husband was surprised when the nasty little interloper came walking up to him, turned and meandered across the deck past our patio doors. After a brief reconnaissance, he wended his way back around from whence he came before waddling up the sidewalk to the road. The whole time with an insouciant air that suggested he believed he was right where he belonged. Since then, he has coated our home with his pungent calling card during one of several nocturnal tours around the property. The blanket of snow has given us the opportunity to track his movement somewhat but we have yet to discover where he's hiding out. As he waddles from here to there, over my lawn, circling my home, my husband and I are the ones who are put out, forced to respect him and his boundaries which are apparently limitless. The irony of this is not lost on me. It's not that I don't love and appreciate wildlife. Assuredly I am awed by their beauty and majesty. Watching a hawk soar above a plowed field. Gazing at a gentle deer as it stands alert by a verdant woodland. Spying a coyote on a forest trail. A chipmunk darting to and fro, cheeks bulging as it stores up for a long cold winter. It is images such as they that are looked upon in wonder and humility. However, when they wander into my territory, when they invade my home, I tend to be a little less impressed. 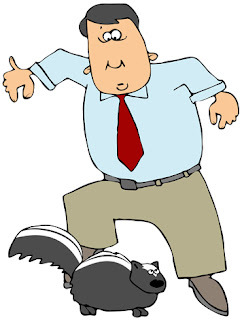 Given that the regulations from our natural resources ministry indicate that live trapping and the removal of an animal more than one kilometre away from where it was caught is illegal, or that until we see our stinky friend out and about in daylight — an unnatural state thereby indicating illness — animal control won't deal with it either. So, it seems, I might be forced to learn to share my space, as undesirable as our guest might be. Growing up it was rare to see wildlife, other than birds, squirrels, bunnies, and toads, frolicking in our neighbourhoods. But as urban centres continue to expand, moving ever closer to natural areas, skunks, raccoons, foxes, deer, bears et al are drawing near. They seek food from our gardens and composts, shelter beneath and inside our buildings. As they have adapted, I suppose so will we.